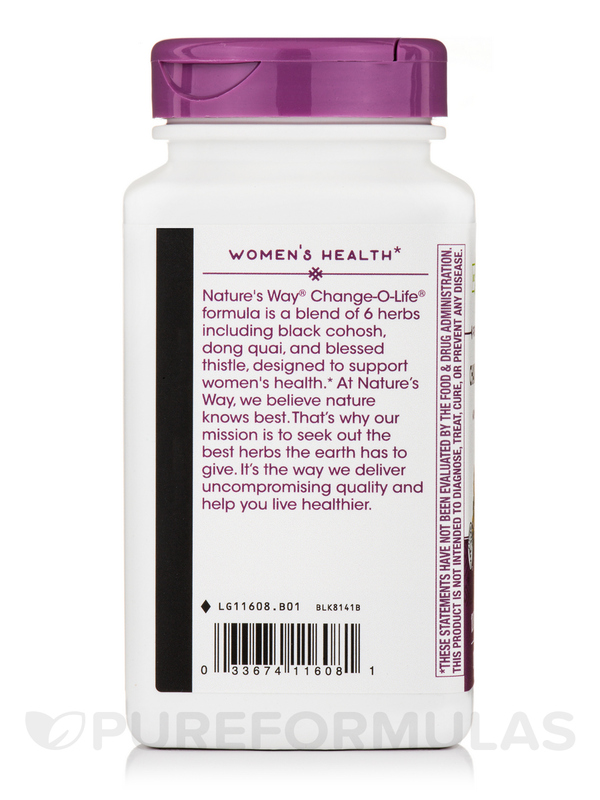 Women may benefit from the seven herb blend of Change-O-Life Capsules from Nature’s Way®. Taken as a dietary supplement‚ it appears to benefit women by providing relief from menopausal symptoms as well as promoting good health on an everyday basis. 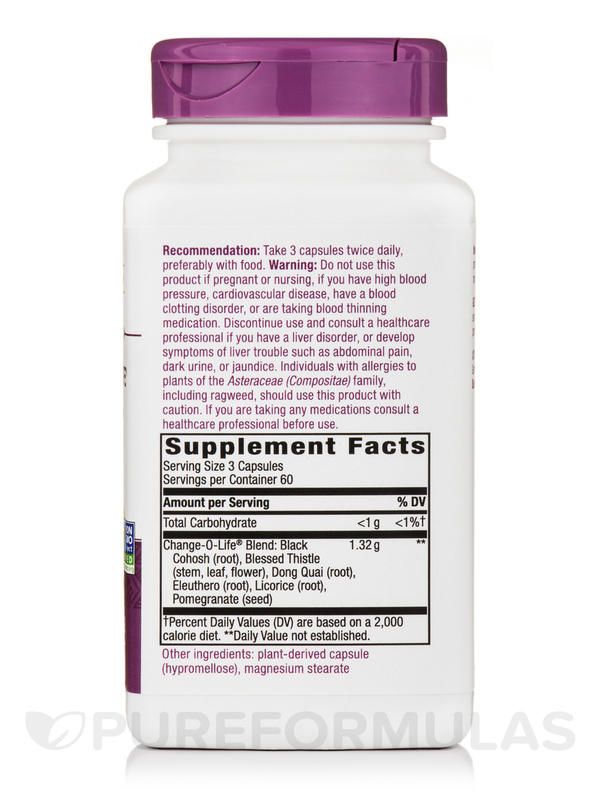 The capsule contains black cohosh‚ which may provide relief from headaches and hot flashes in women. Black cohosh has beneficial effects in soothing heart palpitation and it may relieve cramps. 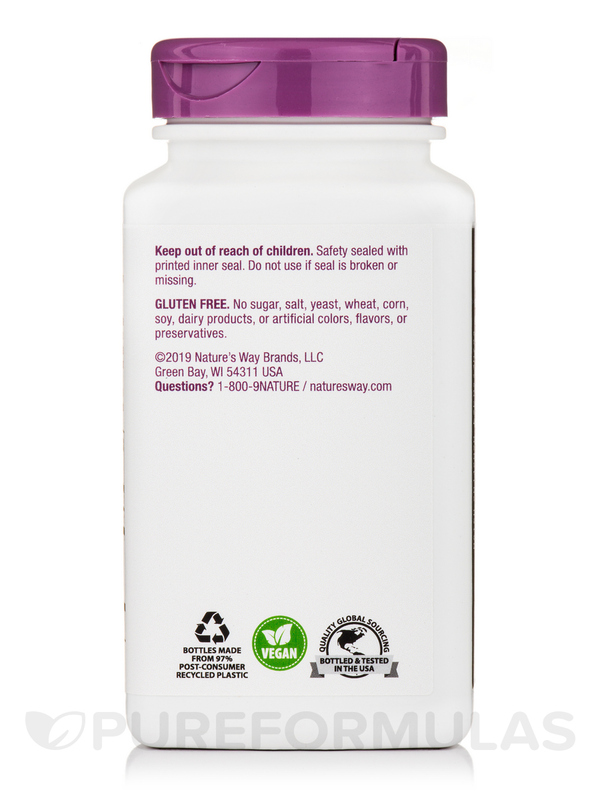 Another ingredient in this women’s supplement from Nature’s Way® is the sarsaparilla root. This has been shown to be beneficial in relieving skin irritations. It may also help in cases of digestive disorders. Dong quai in this capsule may be an excellent blood purifier and relieve joint pain. It appears to promote healthy skin. Licorice helps correct hormonal imbalances while Siberian eleuthero root is an adaptogen that may help you combat everyday stress. Change-O-Life Capsules from Nature’s Way® has pomegranate seeds‚ which are rich in vitamins C and K and are said to aid weight management efforts. 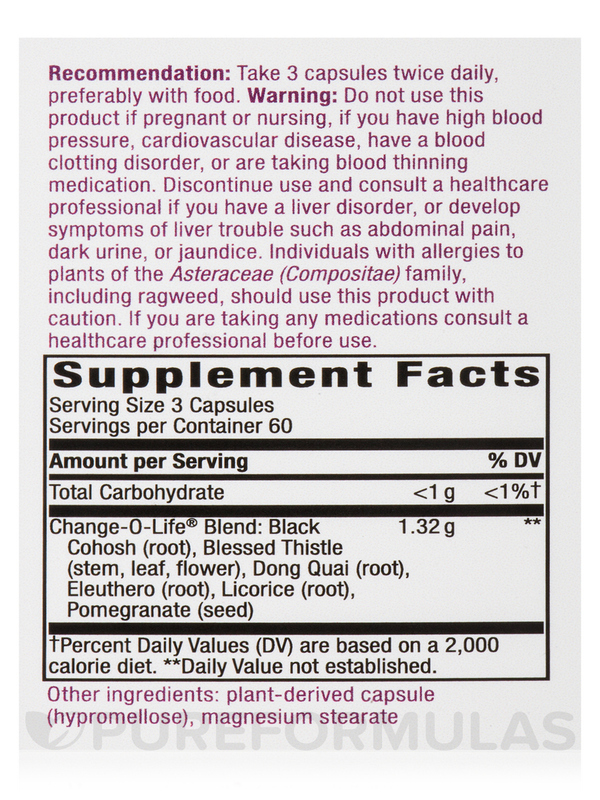 Black Cohosh (Root)‚ Blessed Thistle (stem‚ leaf‚ flower)‚ dong quai (root)‚ eleuthero (root)‚ licorice (root)‚ pomegranate (seed)‚ sarsaparilla (root). No sugar‚ salt‚ yeast‚ wheat‚ corn‚ soy‚ dairy products‚ artificial colors‚ flavors or preservatives. Do not use this product if pregnant or nursing‚ if you have high blood pressure‚ cardiovascular disease‚ have a blood clotting disorder‚ or are taking blood thinning medication. Discontinue use and consult a healthcare professional if you have a liver disorder or develop symptoms of liver trouble such as abdominal pain‚ dark urine or jaundice. Persons with allergies to plants of the Asteraceae (Composite) family including ragweed should use this product with caution. If you are taking any medications consult a healthcare professional before use. I'm 47 years old and starting to feel some pre-menopausal symptoms: hot flashes, moodiness, etc. 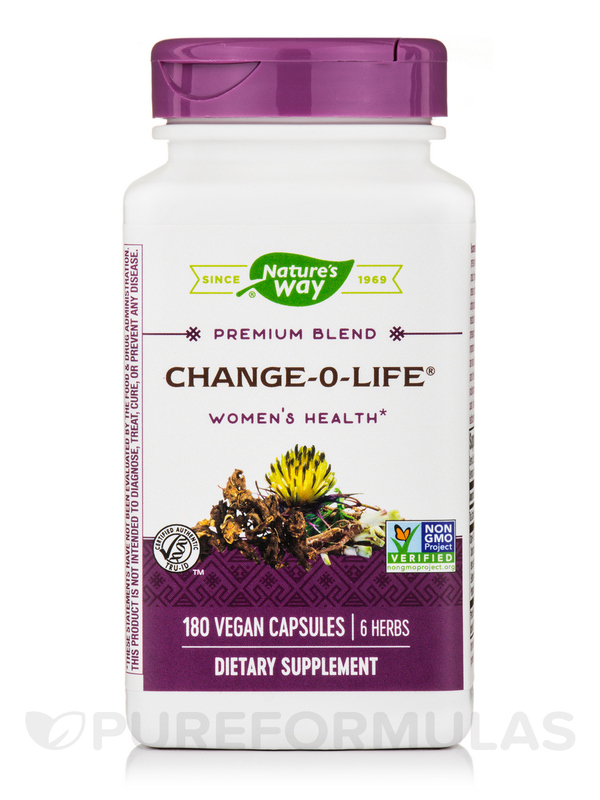 I ordered Change-O-Life by Nature's Way and began taking 3 capsules a day (less than the recommended 6 capsules a day). I am seeing an improvement in symptoms! Fewer hot flashes, calmer mood. It's not a panacea, but every little bit helps! It eliminated by hot flashes! I first learned about Change-O-Life by Nature's Way at Sprouts. The employee there told me that other customers had success with it. I had previously used Estroven, which worked for a while. When I tried Change-O-Life, it took about 3 weeks to kick in, but now I don't have any flashes. Hopefully it will work for you too. Capsules are relatively easy to take and tasteless. I don't have side effects and it works! Having to take it twice per day. I'm just starting using Change O Life by Nature's Way it was highly recommended to me by a friend.I will give it a chance and see if works. Amazingly effective at such good price!! I have been using Change-O- Life by Nature's Way for 2 years and plan on using it. It helps keep me free from "Hot Flashes" and mood swings resulting from female hormone related issues, and from Hot Flashes causes by spikes in blood sugar. I have been able to reduce the amount of hormonal creams in half and with better results than the creams alone. Hats-off to whom ever put this blend together - Many Thanks! It works wonders for me and helps me to save money on the usage of expensive hormone creams - with better results than the creams alone. Nothing - it's all good!! Thank you for reaching out to us, Bev. This is a question that your trusted healthcare practitioner would need to answer. They would be able to give you the best response possible since they’d be familiar with your particular health needs.